Detailed description: This was our prestige model because we wanted to Show what can be done made of a DIY metal kit. We started to develop this harvester already in 2011 and thought we could launch in in the coming year already. However it was complicated to build the structure without getting too heavy. The first tyres couldn't stand the weight of 3.8 kg for longer times. by this we had to Change the moulds of the tyres and takes other materials to make it more strong but still soft enough to get them easy onto the rims. The new discovery of metal construction kits. Exclusive with tronico. With licenses of the original models. The CLAAS LEXION 770 harvester is modeled after its original fully made of metal. 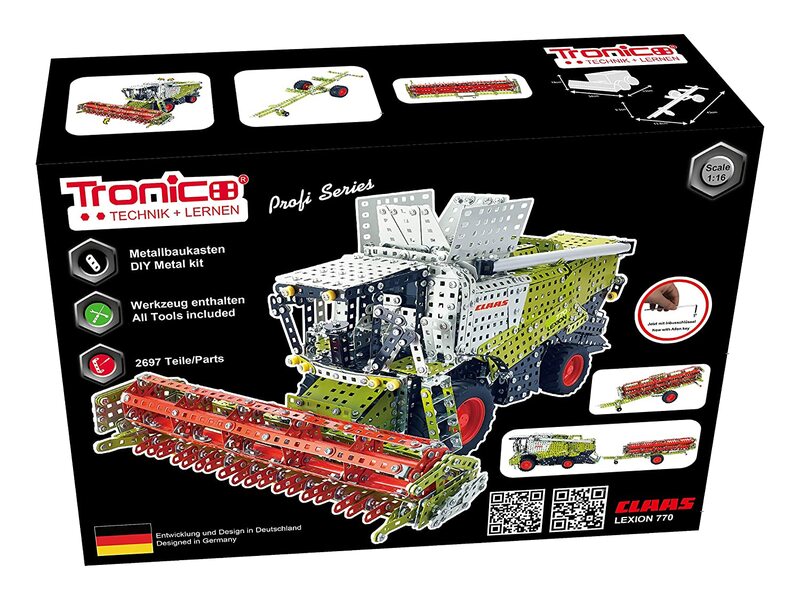 The scale is 1:16 and the CLAAS LEXION 770 from tronico is screwed together from 2463 single parts. It is fully functional. The soft plastic profile tyres are equipped with free-wheel function. The weight of the harvester is 3.8 kg and thus provides a very detailed design. All parts are screwed together with nuts and locked individually. The material of tronico is made from high quality metal and plastic. It comes supplied with a CLAAS LEXION 770 sticker which after completing the assembled model makes it a true original model made of metal. In the cardboard box next to the material you will find tools for assembly, assembly instructions and a colorful picture with control side views of the ready assembled product. We at tronico highly recommend the age of 14 plus or at least with experience in metal kits.